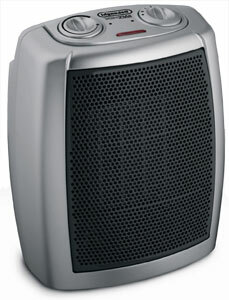 The DeLonghi DCH1030 Safeheat 1500W Basic Ceramic Heater features two heat flow settings. Choose the high setting for 1500 watts or the low setting for 825 watts. The adjustable thermostat lets you easily select and maintain your desired level of comfort. A power indicator light for safe operation indicates when the heater is on. For minimal heat temperature, the anti-freeze setting automatically turns the unit on when the temperature reaches 44 degrees fahrenheit. If the unit becomes too warm, the safety thermal cut-off automatically turns it off. Provide the perfect amount of heat with the DCH1030 Ceramic Heater from DeLonghi. Intense directional flow of heat and better circulation from the large grille lets you enjoy warmth whenever you need it. Use it year-round by operating the fan without heat for summer ventilation. An adjustable thermostat and two heat settings let you achieve as much warmth as you need. And it's safe to operate, with a thermal cut-off and antifreeze settings. The safe and efficient ceramic heating element provides fast and powerful spot heat safely, thanks to the capability of the ceramic element to self-regulate the power output according to the temperature. The appliance is equipped with a room thermostat, to set and automatically maintain the desired temperature. Customize your heating needs with the adjustable thermostat and two heat settings: choose the High setting for 1500 watts of heating power or choose Low for 825 watts. The DCH1030 Ceramic Heater is safe to operate, with thermal cut-off that prevents overheating as well as an antifreeze setting to prevent the heater from seizing up in cold weather. Dimensions: 10" x 8.9" x 7.3"